If you love food as much as I do, chances are that at least once in your life, you’ve overindulged on something scrumptious and your stomach was like, ”Nah, I don’t think so. "And while most people don’t particularly enjoy talking about getting sick or throwing up, sorry to burst your bubble, but we’re gonna talk about it today!One gluttonous python thought it would devour an entire deer carcass in one huge gulp. But quickly after swallowing Bambi, our slithery snake learned that it had bitten off more than it could chew. 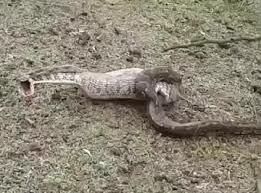 The footage of its struggle is really, truly disgusting.After concerned onlookers began poking the python with sticks, the reptile was finally able to puke up its dinner.